The Suffield Wildcats boys co-op swim team are pictured at Windsor Locks High School, where they won the Nutmeg Conference championship. Coaches Kevin Mattia and Kim Marker hold the championship plaque. 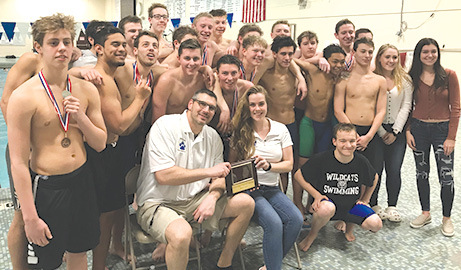 The Wildcats are made up of swimmers from Suffield, Ellington, East Windsor, and Windsor Locks. There are three captains: Drew Martin-Ryan of Suffield, Michael Stavelone of East Windsor and Chris Hoover of Windsor Locks.